The ZOLL E Series monitor defibrillator was designed by professionals for professionals. 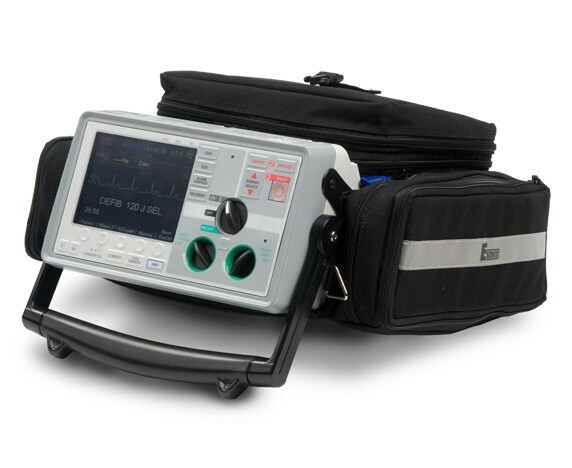 No other full-featured monitor defibrillator was designed specifically for the rigors of your EMS environment. No other defibrillator offers the configurable options of the E Series. Documentation is made easy when combined with data transfer options that take the “paper” away. No other defibrillator is as rugged and ready. ZOLL’s Real CPR Help, which measures chest compressions and rate and depth in real time, and provides visual and optional audible feedback. All CPR data can be recorded and reviewed using RescueNet Code Review software. See-Thru CPR, unique to ZOLL, which allows CPR artifact to be filtered, letting you see organized rhythms without pausing compressions. New innovative roll cage design and shape. EasyRead Tri-Mode Display screen for use in both pitch darkness or direct sunlight. A new Rapid Cable Deployment System for faster deployment. Built-in GPS clock, allowing users to synchronize dispatch, defibrillator, and intervention call times, improving overall data accuracy. Now with integrated SpCO, a noninvasive Masimo Rainbow SET carbon monoxide measurement, the E Series allows rescuers to easily and accurately diagnose CO poisoning with the simple push of a button. Compatibility with ZOLL’s sealed lead acid 4410 Smart Battery as well as rechargeable lithium ion. Integrated optional Bluetooth® functionality to provide data transmission capability to a variety of destinations. ZOLL’s proprietary Rectilinear Biphasic waveform, the only biphasic waveform cleared by the FDA to claim superiority to monophasic waveforms for the conversion of ventricular fibrillation in high impedance patients. Click the button below to add the Zoll E Series Defibrillator to your wish list.